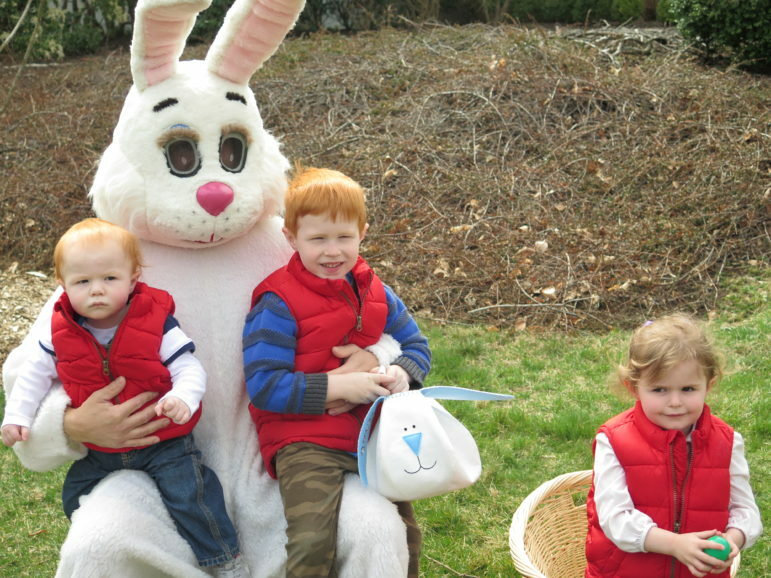 Large bunny collects kids at a previous DCA easter egg hunt. Please come early, as the Easter Egg Hunt starts at 10 a.m. sharp on Friday, April 19 (Good Friday) and takes only a few minutes. A special appearance by the Easter Bunny makes this a wonderful morning. Parking at the DCA is limited, carpooling is encouraged. In the event of inclement weather, a cancellation of the egg hunt will be announced on our DCA website, e-blast, and voicemail greeting that morning. The cost is $20 cash per car. Reservations are not required. The hunt will be held at the DCA, at 274 Middlesex Road in Darien, weather permitting. For more information please contact the DCA at Info@DarienDCA.org or 203-655-9050 extension 10. Living Hope Community Church is inviting area families, including those from Darien, to their annual Easter Egg Hunt on Saturday, April 13 at 10 a.m. In addition to a hunt for 3,000 eggs, kids. can enjoy crafts, petting zoo and refreshments enhanced with a short Easter message! Living Hope Community Church is at 38 West End Ave., Old Greenwich. You can call 203-637-3669 for more information. This article originally was published on April 6. The timestamp has been changed to move the link back to the home page.